A leading researcher suggests the Red Planet’s harsh atmosphere means its surface might not be the most likely place to find the building blocks for life. If we're looking for life on Mars, start underground. That's the exhortation from a leading researcher who recently led a paper on organics compounds on Mars. Organic compounds containing carbon, hydrogen, and other molecules such as nitrogen are common in the solar system. They're also sometimes an indication of life. But the compounds, just like life itself, are somewhat delicate. Radiation falling on the martian surface might destroy any organics that are there. Jennifer Eigenbrode suggests that by digging a little deeper researchers might find something interesting. "Mars is full of surprises," Eigenbrode, an interdisciplinary astrobiologist at NASA's Goddard Space Flight Center in Maryland, told Seeker. "You could easily be fooled, but is there going to be organic matter there? Probably. Is it going to tell us what we want to know [about life]? Maybe. Something we didn't think to ask? Probably." 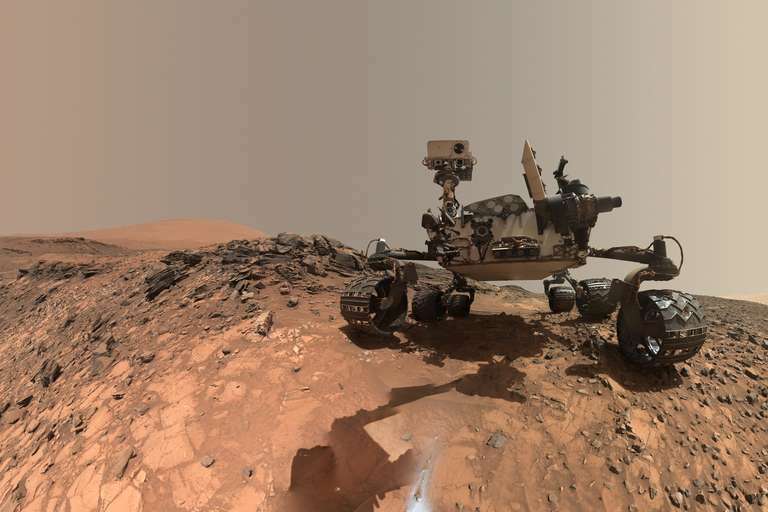 In June, Eigenbrode's team published a paper in the journal Science saying that NASA's Curiosity rover found organic molecules still preserved in 3-billion-year-old sedimentary rocks found at the base of Mount Sharp. It wasn’t Curiosity's first organics find, but it's the highest concentration of organics Curiosity had yet uncovered. The find is remarkable given that Curiosity's landing site, Gale Crater, was once a lake that probably had "all the ingredients necessary for life," such as chemical building blocks and energy sources, according to a NASA statement. Because Eigenbrode's team found organic molecules in the top five centimeters (2 inches) of Martian soil, the researchers suggest that the find showed Mars might have been habitable. But the Mars of ancient days is not the same as Mars today. The surface of Mars is likely not a friendly spot for life today, because it is baked in radiation and lacking abundant water. While little is known about the interior of Mars, Eigenbrode suggests that microorganisms beneath the surface would be sheltered from the radiation and be in closer proximity to sources of water from which they could draw energy. Mars was likely more habitable in the distant past, because there is extensive evidence of water running on its surface, such as river features or rocks, which formed in watery environments. But as the atmosphere of Mars thinned over billions of years, there was not enough atmospheric pressure for water to keep flowing. Why did the martian atmosphere disappear? Some researchers suggest it’s because the sun’s constant stream of charged particles knocked away carbon and other types of molecules in the atmosphere. Since Mars has no global magnetic field to deflect the sun’s particles, they were able to crash directly into these molecules and knock them out into space. NASA’s MAVEN (Mars Atmosphere and Volatile Evolution) spacecraft is currently investigating martian atmospheric loss. Researchers said the newfound organics on Mars were especially tough. They were embedded within 3.5-billion-year-old rock, surviving wind, water, and changes on the surface of Mars, and were exposed only after being heated in an oven aboard Curiosity. Curiosity isn't designed to probe the organics much further; its real mission is to search for habitable environments, not life itself. But future Mars missions will probe further. The European Space Agency's Mars 2020 rover is designed to drill down to a depth of at least two meters, collecting samples along the way. Eigenbrode said she can't wait to see if Mars 2020 finds organics. Other researchers argue life could be present on the surface of Mars. Mysterious features called recurring slope lineae tend to pop up on the slopes of craters, appearing as dark streaks during warmer weather. Some measurements suggest RSL include a sort of briny water, while other researchers argue the water may be from the atmosphere. But if there is running water there, microbes might also be inside. Mars is just one location in the solar system where we've detected organics. In late June, another research team using the Cassini spacecraft announced they found complex organics in a water plume jetting up from the icy moon of Enceladus. In recent years, the Dawn spacecraft found tar-like organics on the surface of dwarf planet Ceres, and the Rosetta spacecraft detected organics such as the amino acid glycine on Comet 67P/Churyumov-Gersimenko. Organics were even found on Mercury, the planet that orbits closest to our sun.